History/Mythology: Chrysoprase is an apple green form of Chalcedony and has been very popular in Jewelry. It’s apple green colouring comes due to traces of nickel that run through the stone.. In ancient times chrysoprase was associated with the Goddess Venus and love and represented the divine love of truth. Chrysoprase is the apple green coloured form of Chalcedony and has a gentle yet very strong vibration of divine truth. It helps the heart stay strong through times of depression and anxiety by promoting a sense of joy and happiness Chalcedony also allows us to recognize and be at peace with our current situation. Healer and people recovering from illness find Chroysoprase to be a very useful stone as it assist the healing process at a cellular level which give a very deep healing. Is a stone of overall abundance and prosperity stone and will attract new love into your life if you desire it. If is a stone that will allow you to see if you are in a co-dependent relationship and open your eye to why you are and help give you the independence to understand why so that you can move on to become more independent. Meditating in order to connect with your inner child and have a great acceptance of who you are. Laid directly on the affected body part during healing. Laid directly on the heart Chakra or Solar Plexus during healing. Worn as a piece of jewelry and is very effective when keep within the aura. 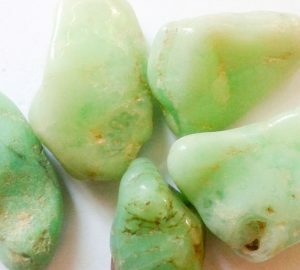 Chrysoprase can also safely be used as a gem elixir.